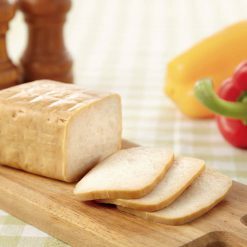 The chicken breasts in this ham chicken are high in protein and low in fat. The flavor is a Japanese-style marinated soy-sauce special. This product uses chicken breasts and ham with a simple soy sauce flavor. High quality raw meats are included in the list of ingredients, that were then carefully marinated over a course of a long time at low temperature with some added salt for taste. Automated machinery were never utilized. Additives were also not used. Please note: this product does not contain additives aside from that in the seasoning, binding agents, other antioxidant and spice extracts. Binding agents are any ingredient that can help a mixture retain its shape or remain bound. Sometimes binding agents can also be responsible for adding texture as well. Binding agents are typically added to the foodstuff at different stages throughout the cooking process and service, depending on the binding agent and how it is used. Thaw in the refrigerator or under running water in case you are pressed on time, all the while still in the bag.After thawing, please serve after cutting to the size and potions of your choice.Please enjoy as soon as possible after thawing. 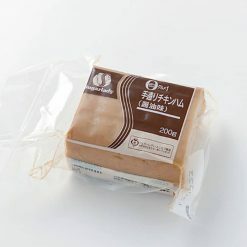 This product contains chicken breast meat (domestic), rapeseed oil, waxy corn starch, syrup, powdered vegetable protein (soy), salt, seasoning extract (yeast, gelatin, wheat gluten), sugar, egg white, fermented rice seasoning, whey minerals, ginger, [pickling liquid] soy sauce, sugar, fermented rice seasoning, seasoning extract (yeast, gelatin, wheat gluten), ginger, glucose, spices. This product is not suitable for anyone with allergies to egg, milk, wheat, soy, chicken or gelatin.